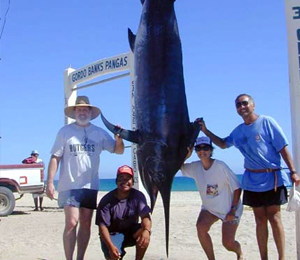 If you are interested in big game fishing, then you have to do your fishing in Cabo San Lucas. Cabo San Lucas is world renowned as one of the premier fishing destinations on the planet. The ocean at the edge of the city is home to numerous species of fish, some of the best and most active fishermen, and some of the most prestigious fishing tournaments in the world. Be you a sportsman, outdoorsman, or just interested in casting a line, Cabo San Lucas fishing is something you just have to do. Cabo boasts some of the most fertile waters and a huge underwater community of fish, sharks, and sea life. We here at Cabo Fishing Fleet want to help you make the most of your vacation fishing in Cabo San Lucas. At Cabo Fishing Fleet, we offer Cabo deep sea fishing, light tackle fishing, and fly fishing to accommodate anglers of every age, interest, and skill level. Whether your game is tuna or marlin, shark or dolphin, our expert fishermen will help you make your Cabo San Lucas fishing experience a fruitful one. If you are looking to land the big catch, deep sea fishing might be right up your alley. Looking to spend a nice few hours enjoying the sun and weather? Fly fishing or light tackle fishing may be more your speed. However, with the fertile waters of Cabo, don't be surprised if you land the day's big catch while relaxing in the comfort of your rented boat. We are called Cabo Fishing Fleet for a very simple reason, we have a large selection of boats. Whether you need a small fishing boat or a yacht for party fishing, we at Cabo Fishing Fleet can help you make your vacation fishing in Cabo San Lucas a huge success. For large parties, try our 70' party boat. It is perfect for groups of people who want to stretch out and have a good time on the water. Our 24' sportster is perfect for fly and light tackle fishing. Any size, big or small, Cab Fishing Fleet has you covered next time you're in Cabo San Lucas fishing. To make the most of your Cabo San Lucas fishing trip, you will need great instruction. At Cabo Fishing Fleet, we employ a team of world class fishermen to show you the ropes and guide you through all aspects of landing any fish you hope to catch on your Cabo San Lucas fishing trip. Our instructors are tournament winning professionals, meaning the instruction you receive is the finest you can get when fishing in Cabo San Lucas. Not coming to Cabo? We can help you book trips to many other exotic locations. From scuba diving in Key West to Swimming with dolphins in Bahamas to snorkeling in Key West, we have the resources and connections to make your stay in any fine vacation destination fun without breaking the bank.